At bedtime I tell the kids stories about my boyhood experiences riding bikes and swimming in canals and ponds and takin’ sweet jumps in Basalt Idaho, a town of 300 in Eastern Idaho (not that far from Preston Idaho- Napoleon Dynamite was my neighbor). Jack lays snuggled up with his hands behind his head perfectly still trained on every word. I try to make the stories full of sounds, smells, and zest. For me, life in a small Idaho town in the early 80’s was a wonderland. Boyhood never changes. Only the world around it does. 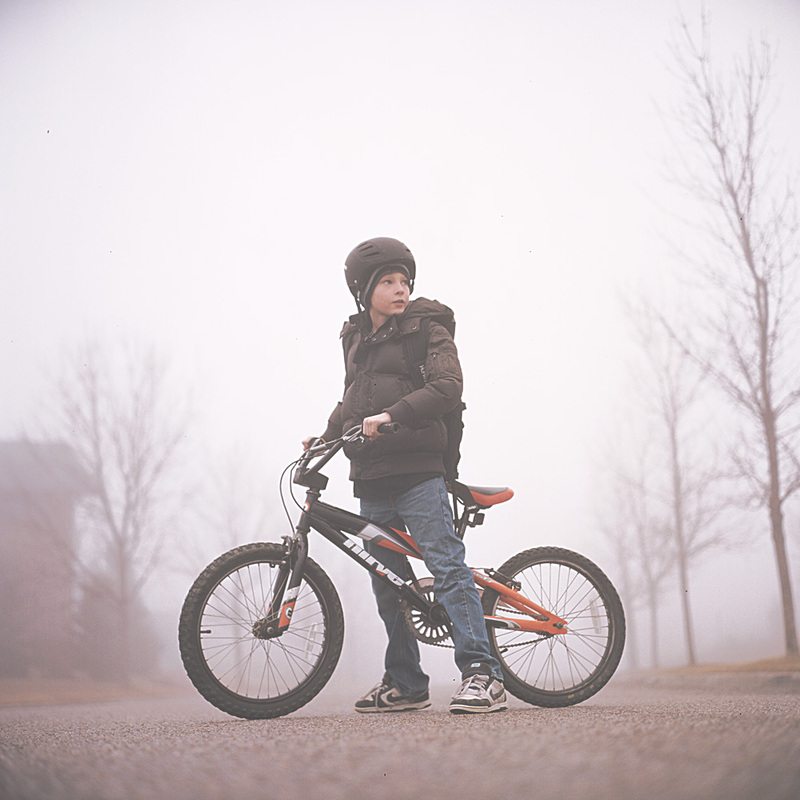 As a result Jack yearned to ride his bicycle to school while we lived in California. He even purchased this bike at a neighborhood garage sale in anticipation for the day that it could happen. He was waiting to get to the 4th grade, the earliest age the school allowed to ride to school. Now that we moved to Idaho and the bike riding limits are off, he scrambles his bike and speeds each day to his awaiting friends at school to play wallball, the school-wide obsession. This particular morning fog filled the neighborhood it reminded me of a Carl Sandburg poem. Jack is bathed in foggy light. It is so easy to shoot in this stuff. I am perpetually drawn to it with my camera. It never ceases to motivate my photographic desires. Shot with my Rolleiflex FX onto Ektar 100 color film. Exposure unknown. This image illustrates one of the most attractive features of the Rolleiflex cameras. You can put the camera on the ground and look down onto the ground glass. The lens is a mere 2 inches off the ground when you do this so your subject almost always has a clean background. It makes the photograph so much more clean and powerful. If you were to do this with a SLR you would be on your belly. It was around 30 degrees so in the wet street that would not be pleasant. -Jon Ball is a professional photographer who shoots portraits of children and families to scratch out a living. His portraits can be found at www.studiojonball.com. He resides in Boise Idaho with his family of 6.75.